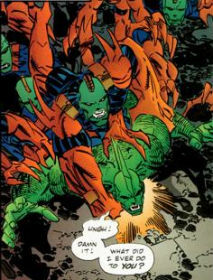 NOTE: The Cosmic Cops created by Erik Larsen, with help from Keith Giffen and Victor Bridges. The intergalactic peacekeepers dubbed the Cosmic Cops originally arrived on Earth in pursuit of the Matrix Swarm. Once this threat had been neutralized, they decided to stay behind and transform the planet into a world of justice and obedience. CyberFace went to oppose these aliens, slaughtering them all and seizing their technology to enable him to conquer New York City. The Cosmic Cops’ corpses were then rebuilt into remote-controlled drones to be used by CyberFace.